During 12 months of 2018, JSC Ukrgasvydobuvannya transferred UAH 1.250 billion to local budgets, in the territory of which the Company carries out hydrocarbon production. 5% of rent payments for December 2018, which is more than UAH 132.2 million, will be transferred to budgets of different levels in 11 regions. Most of these monetary funds are concentrated in two gas production regions: Kharkiv and Poltava. 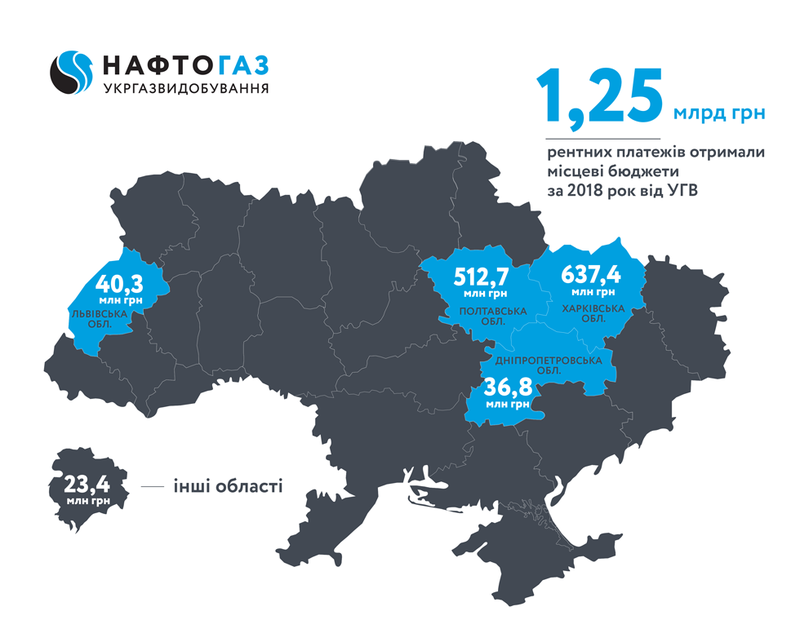 UAH 66.7 million will be directed to different local budgets in the Kharkiv Region, UAH 55.1 million in the Poltava Region, UAH 4.5 million in the Lviv Region and UAH 3.5 million in the Dnipropetrovsk Region. The remaining amount of UAH 2.4 million of rent payments for November 2018 was transferred to Ivano-Frankivsk, Luhansk, Sumy, Volyn, Chernivtsi, Zakarpattia and Donetsk Regions.